Some time ago I wrote a post on a paper by Tony Cox which describes some flaws in risk matrices (as they are commonly used) and proposes an axiomatic approach to address some of the problems. 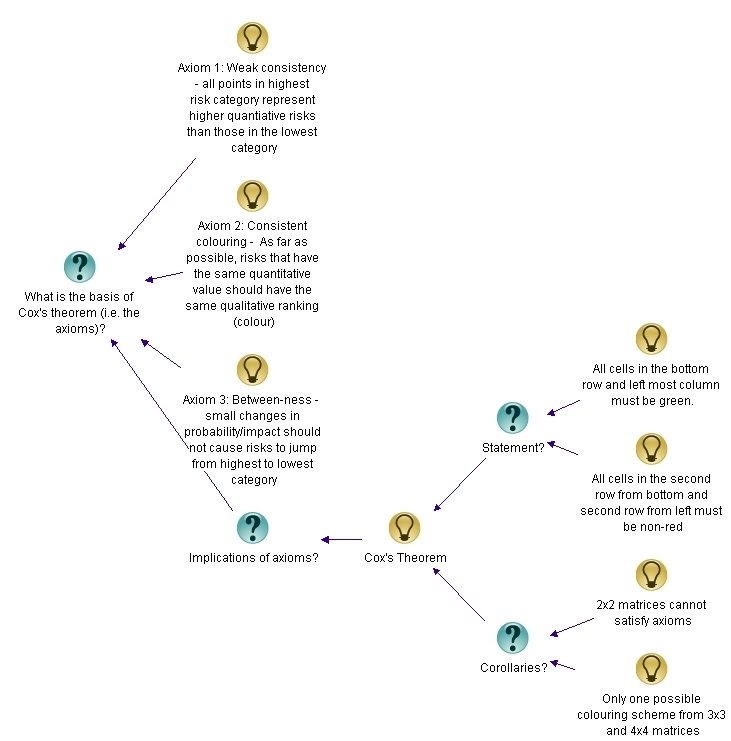 In a recent comment on that post, Tony Waisanen suggested that someone take up the challenge to map the content of the post and the ensuing discussion using issue mapping. Hence my motivation to write the present post. Create an issue map visualising the content of my post on Cox’s paper. Incorporate points raised in the comments into the map, and show how they relate to Cox’s arguments. Cox ask’s the question: “What’s wrong with risk matrices?” – this is, in fact, the title of the paper in which he describes his theorem. The question is therefore an excellent starting point for our map. 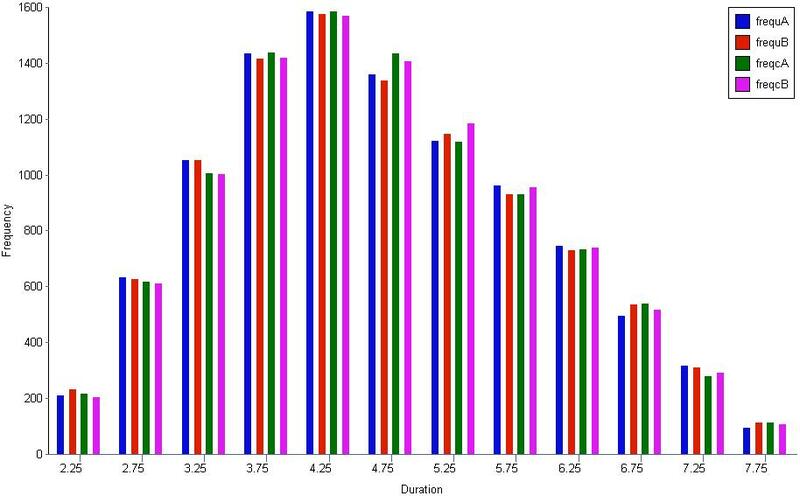 Poor resolution: risk matrices use qualitative categories (typically denoted by colour – red, green, yellow). Risks within a category cannot be distiguished. 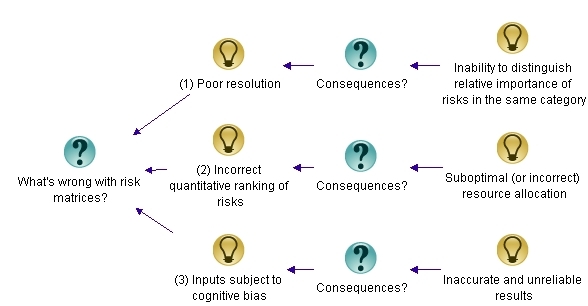 Incorrect ranking of risks: In some cases, risks can end up in the wrong qualitative category – i.e. a quantitatively higher risk can be mistakenly categorised as a low risk and vice versa. In the worst case, this can lead to suboptimal resource allocation – i.e. a lower risk being given a higher priority. Subjective inputs: Often, the criteria used to rank risks are based on subjective inputs. Such subjective inputs are prone to cognitive bias. This leads to inaccurate and unreliable risk rankings. See my posts limitations of scoring methods in risk analysis and cognitive biases as project meta-risks for more on the above points. 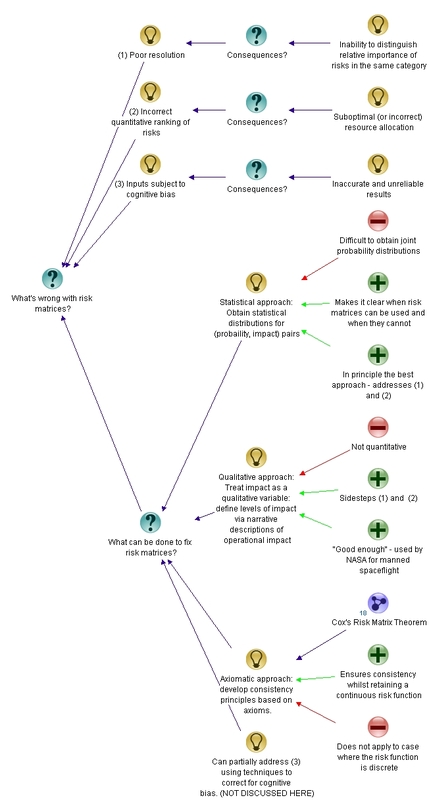 The map with the root question, problems (ideas or responses, in IBIS terminology) and their consequences is shown in Figure 1. Note that I’ve put numbers (1), (2) etc. against the points so that I can refer to them by number in other nodes. Figure 1: What's wrong with risk matrices? Statistical approach: This involves obtaining the correct statistical distributions for probability of the risk occuring and the impact of the risk. This is generally hard to do because of the lack of data. However, once this is done, it obviates the need for risk matrices. Furthermore, it warns us about situations in which risk matrices may mislead. In Cox’s words, “One (approach) is to consider applications in which there are sufficient data to draw some inferences about the statistical distribution of (Probability, Consequence) pairs. If data are sufficiently plentiful, then statistical and artificial intelligence tools … can potentially be applied to help design risk matrices that give efficient or optimal (according to various criteria) discrete approximations to the quantitative distribution of risks. In such data-rich settings, it might be possible to use risk matrices when they are useful (e.g., if probability and consequence are strongly positively correlated) and to avoid them when they are not (e.g., if probability and consequence are strongly negatively correlated).” This is, in principle, the best approach. Axiomatic approach: This is the approach that Tony Cox discusses in his paper. It has the advantage of being simple – it assumes that the risk function (defined as probability x impact, for example) is continuous whilst also ensuring consistency to the extent possible (i.e. ensuring a correct quantitative ranking of risks). The downside, as Glen emphasises in his comments, is that risk functions are actually discrete, as discussed in (1) above. Cox’s arguments hinge on the continuity of the risk function, so they do not apply to the discrete case. The map with these approaches added in is depicted in Figure 2. Note that I’ve added Cox’s theorem in as a map node, indicating that a detailed discussion of the theorem is presented in a separate map. Figure 2: ...and what can be done to fix them. Note also, that I have added an idea node representing how the issue regarding subjective inputs can be addressed. I will not pursue this point further in the present post as it did not come up in the discussion. That said, I have discussed this point in some detail in an article on cognitive bias in project risk management. Since the entire discussion is based on Cox’s arguments, it is worth looking into his paper in some detail – in particular, at the axioms and the theorem itself. It is convenient to hive this material off into a separate map, but one connected to the original map (see the map node representing the theorem in Figure 2 above). The root question of the new map would be, “What is the basis of Cox’s theorem?” Answer: the theorem is based on the axioms and other (tacit) assumptions. Weak consistency – which states that all risks in the highest category (red) must represent quantitatively higher risks than those in the lowest category (green). Consistent colouring – As far as possible, risks with the same quantitative value must have the same colour. Between-ness – small changes in probability or impact (i.e. the risk function) should not cause a risk to move from the highest (red) to lowest (green) or vice versa. 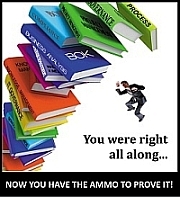 The axioms are intuitively appealing – they express a basic consistency that one would expect risk matrices to satisfy. The secondary map, with the three axioms shown is depicted in Figure 3. Cox’s theorem, which essentially follows from these axioms, can be stated as follows: In a risk matrix that satisfies the three axioms, all cells in the bottom row and left-most column must be green and all cells in the second from bottom row and second from left column must be non-red. 2×2 matrices cannot satisfy the theorem. 3×3 and 4×4 matrices which satisfy the theorem have a unique colouring scheme. These are rather surprising conclusions, arrived at from some very intuitive axioms. The secondary map, with the theorem and corollaries added in is shown in Fig. 4. That completes the mapping exercise: Figures 2 and 5 represent a fairly complete map of the post and the discussion around it. At the risk of belaboring the obvious, the maps represent my interpretation of Cox’s work and my interpretation of others’ comments on my post on Cox’s work. Further, the discussion on which the maps are based is far from comprehensive because it did not cover other limitations of risk matrices. Please see my post on limitations of scoring methods in risk analysis for a detailed discussion of these. Before closing, it is worth looking at the Figures 2 and 5 from a broader perspective: the figures make clear the context of the discussion in a way that is simply not possible through words. 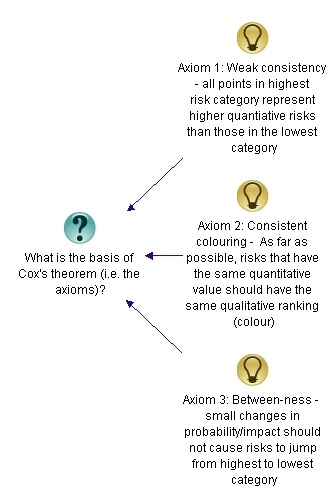 As an example, Figure 2 lays bare the context of Cox’s theorem – it emphasises, for example, that Cox’s approach isn’t the only method to fix what’s wrong with risk matrices. Further, Figure 5 distinguishes between explicitly declared and tacit assumptions. Examples of the former are the three axioms and that of the latter is the assumption of continuity. In this post I’ve summarised the content and context of Cox’s risk matrix theorem via issue mapping. 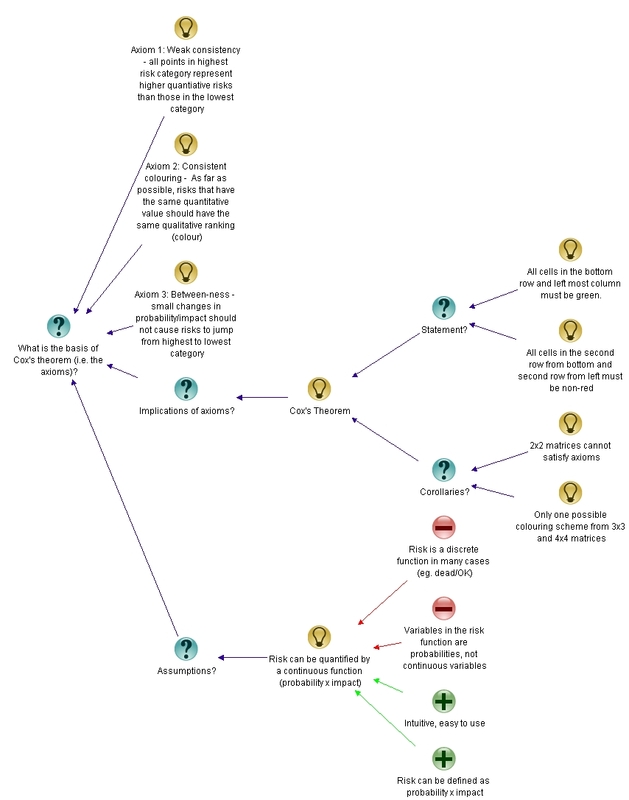 The maps provide an “at a glance” summary of the theorem alongwith supporting assumptions and axioms. Further, the maps also incorporate key elements of readers’ reaction regarding the post. I hope this example clarifies the content and context of my earlier post on Cox’s risk matrix theorem, whilst also serving as a demonstration of the utility of the IBIS notation in mapping complex arguments. Thanks go out to Tony Waisanen for suggesting that the post and comments be issue mapped, and to Glen Alleman, Robert Higgins and Prakash Vaidhyanathan for their contributions to the discussion. Project tasks can have a variety of dependencies. The most commonly encountered ones are task scheduling dependencies such as finish-to-start and start-to-start relationships which are available in many scheduling tools. However, other kinds of dependencies are possible too. For example, it can happen that the durations of two tasks are correlated in such a way that if one task takes longer or shorter than average, then so does the other. [Note: In statistics such a relationship between two quantities is called a positive correlation and an inverse relationship is termed a negative correlation]. In the absence of detailed knowledge of the relationship, one can model such duration dependencies through statistical correlation coefficients. In my previous post, I showed – via Monte Carlo simulations – that the uncertainty in the duration of a project increases if project task durations are positively correlated (the increase in uncertainty being relative to the uncorrelated case). At first sight this is counter-intuitive, even paradoxical. Knowing that tasks are correlated essentially amounts to more knowledge about the tasks as compared to the uncorrelated case. More knowledge should equate to less uncertainty, so one would expect the uncertainty to decrease compared to the uncorrelated case. This post discusses the paradox and its resolution using the example presented in the previous post. I’ll begin with a brief recapitulation of the main points of the previous post and then discuss the paradox in some detail. No correlation between the two tasks. A correlation coefficient of 0.79 between the two tasks. 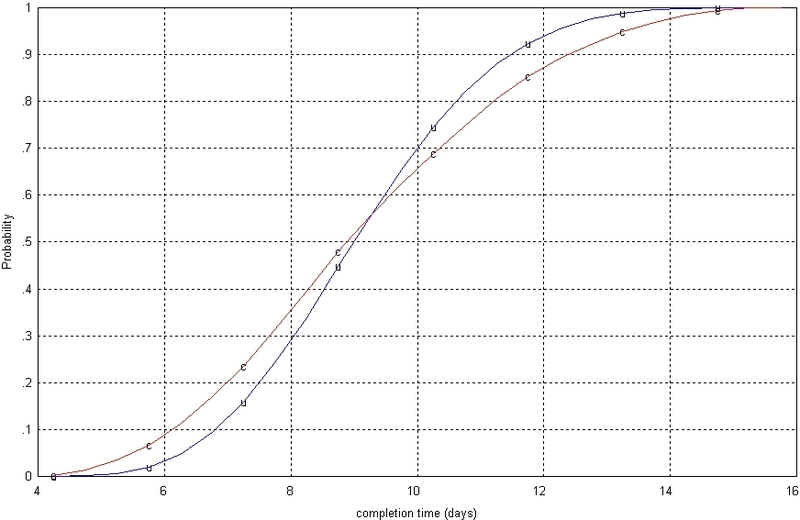 The simulations yielded probability distributions for overall completion times for the two cases. I then calculated the standard deviation for both distributions. The standard deviation is a measure of the “spread” or uncertainty represented by a distribution. The standard deviation for the correlated case turned out to be more than 30% larger than that for the uncorrelated case (2.33 and 1.77 days respectively), indicating that the probability distribution for the correlated case has a much wider spread than that for the uncorrelated case. The difference in spread can be seen quite clearly in figure 5 of my previous post, which depicts the frequency histograms for the two simulations (the frequency histograms are essentially proportional to the probability distribution). Note that the averages for the two cases are 9.34 and 9.32 days – statistically identical, as we might expect, because the tasks are identically distributed. Why is the uncertainty (as measured by the standard deviation of the distribution) greater in the correlated case? Here’s a brief explanation why. In the uncorrelated case, the outcome of the first task has no bearing on the outcome of the second. So if the first task takes longer than the average time (or more precisely, median time), the second one would have an even chance of finishing before the average time of the distribution. There is, therefore, a good chance in the uncorrelated case that overruns (underruns) in the first task will be cancelled out by underruns (overruns) in the second. This is essentially why the combined distribution for the uncorrelated case is more symmetric than that of the correlated case (see figure 5 of the previous post). In the correlated case, however, if the first task takes longer than the median time, chances are that the second task will take longer than the median too (with a similar argument holding for shorter-than-median times). The second task thus has an effect of amplifying the outcome of the first task. This effect becomes more pronounced as we move towards the extremes of the distribution, thus making extreme outcomes more likely than in the uncorrelated case. This has the effect of broadening the combined probability distribution – and hence the larger standard deviation. Now, although the above explanation is technically correct, the sense that something’s not quite right remains: how can it be that knowing more about the tasks that make up a project results in increased overall uncertainty? The key to resolving the paradox lies in looking at the situation after task A has completed but B is yet to start. Let’s look at this in some detail. Consider the uncorrelated case first. The two tasks are independent, so after A completes, we still know nothing more about the possible duration of B other than that it is triangularly distributed with min, max and most likely times of 2, 4 and 8 days. In the correlated case, however, the duration of B tracks the duration of A – that is, if A takes a long (or short) time then so will B. So, after A has completed, we have a pretty good idea of how long B will take. Our knowledge of the correlation works to reduce the uncertainty in B – but only after A is done. One can also frame the argument in terms of conditional probability. In the uncorrelated case, the probability distribution of B – let’s call it p(B) – is independent of A. So the conditional probability of B given that A has already finished (often denoted as P(B|A)) is identical to P(B). That is, there is no change in our knowledge of B after A has completed. Remember that we know p(B) – it is a triangular distribution with min, max and most likely completion times of 2, 4 and 8 days respectively. In the correlated case, however, P(B|A) is not the same as P(B) – the knowledge that A has completed has a huge bearing on the distribution of B. 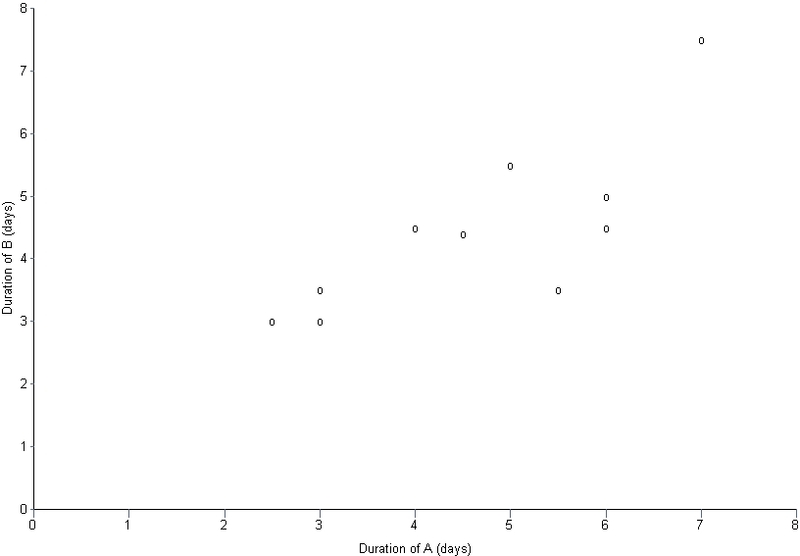 Even if one does not know the conditional distribution of B, one can say with some certainty that outcomes close to the duration of A are very likely, and outcomes substantially different from A are highly unlikely. The degree of “unlikeliness” – and the consequent shape of the distribution – depends on the value of the correlation coefficient. So we see that, on the one hand, positive correlations between tasks increase uncertainty in the overall duration of the two tasks. This happens because a wider range of outcomes are possible when the tasks are correlated. On the other hand knowledge of the correlation can also reduce uncertainty – but only after one of the correlated tasks is done. There is no paradox here, its all a question of where we are on the project timeline. Of course, one can argue that the paradox is an artefact of the assumption that the two tasks remain triangularly distributed in the correlated case. It is far from obvious that this assumption is correct, and it is hard to validate in the real world. That said, I should add that most commercially available simulation tools treat correlations in much the same way as I have done in my previous post – see this article from the @Risk knowledge base, for example. In the end, though, even if the paradox is only an artefact of modelling and has no real world application, it is still a good pedagogic example of how probability distributions can combine to give counter-intuitive results. Thanks to Vlado Bokan for several interesting conversations relating to this paradox. Some time ago, I wrote a couple of posts on Monte Carlo simulation of project tasks: the the first post presented a fairly detailed introduction to the technique and the second illustrated its use via three simple examples. The examples in the latter demonstrated the effect of various dependencies on overall completion times. The dependencies discussed were: two tasks in series (finish-to-start dependency), two tasks in series with a time delay (finish-to-start dependency with a lag) and two tasks in parallel (start-to-start dependency). All of these are dependencies in timing: i.e. they dictate when a successor task can start in relation to its predecessor. However, there are several practical situations in which task durations are correlated – that is, the duration of one task depends on the duration of another. As an example, a project manager working for an enterprise software company might notice that the longer it takes to elicit requirements the longer it takes to customise the software. When tasks are correlated thus, it is of interest to find out the effect of the correlation on the overall (project) completion time. In this post I explore the effect of correlations on project schedules via Monte Carlo simulation of a simple “project” consisting of two tasks in series. A bit about what’s coming before we dive into it. I begin with a brief discusssion on how correlations are quantified. I then describe the simulation procedure, following which I present results for the example mentioned earlier, with and without correlations. I then present a detailed comparison of the results for the uncorrelated and correlated cases. It turns out that correlations increase uncertainty. This seemed counter-intuitive to me at first, but the simulations helped me see why it is so. Note that I’ve attempted to keep the discussion intuitive and (largely) non-mathematical by relying on graphs and tables rather than formulae. There are a few formulae but most of these can be skipped quite safely. Figure 1 shows a plot of the duration of A vs. the duration of B. The plot suggests that there is a relationship between the two tasks – the longer A takes, the chances are that B will take longer too. 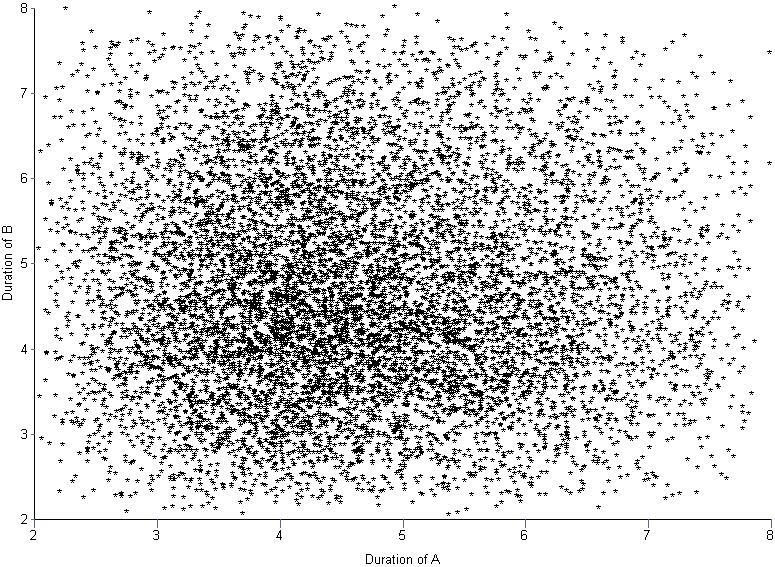 In technical terms we would say that A and B are positively correlated (if one decreased as the other increased, the correlation would be negative). In this case and are the durations of the tasks A and B the th time the project was performed, the average duration of A, the average duration of B and the total number of data points (10 in this case). The capital sigma ( ) simply denotes a sum from 1 to N.
The Pearson coefficient, can vary between -1 and 1: the former being a perfect negative correlation and the latter a perfect positive one [Note: The Pearson coefficient is sometimes referred to as the product-moment correlation coefficient]. On calculating for the above data, using the CORREL function in Excel, I get a value of 0.787 (Note that one could just as well use the PEARSON function). This is a good indication that there is something going on here – the two tasks are likely not independent as originally assumed. Note that the correlation coefficient does not tell us anything about the form of the dependence between A and B; it only tells us that they are dependent and whether the dependence is positive or negative. It is also important to note that there is a difference between quantifying the correlation via the Pearson (or any other) coefficient and developing an understanding of why there is a correlation. The coefficient tells us nothing about the latter. If A and B are correlated as discussed above, simulations which assume the tasks to be independent will not be correct. In the remainder of this article I’ll discuss how correlations affect overall task durations via a Monte Carlo simulation of the aforementioned example. There are two considerations when simulating correlated tasks. The first is to characterize the correlation accurately. For the purposes of the present discussion I’ll assume that the correlation is described adequately by a single coefficient as discussed in the previous section. The second issue is to generate correlated completion times that satisfy the individual task duration distributions (Remember that the two tasks A and B have completion times that are described by a triangular distribution with minimum, maximum and most likely times of 2, 4 and 8 days). What we are asking for, in effect, is a way to generate a series of two correlated random numbers, each of which satisfy the triangular distribution. The best known algorithm to generate correlated sets of random numbers in a way that preserves the individual (input) distributions is due to Iman and Conover. The beauty of the Iman-Conover algorithm is that it takes the uncorrelated data for tasks A and B (simulated separately) as input and induces the desired correlation by simply re-ordering the uncorrelated data. 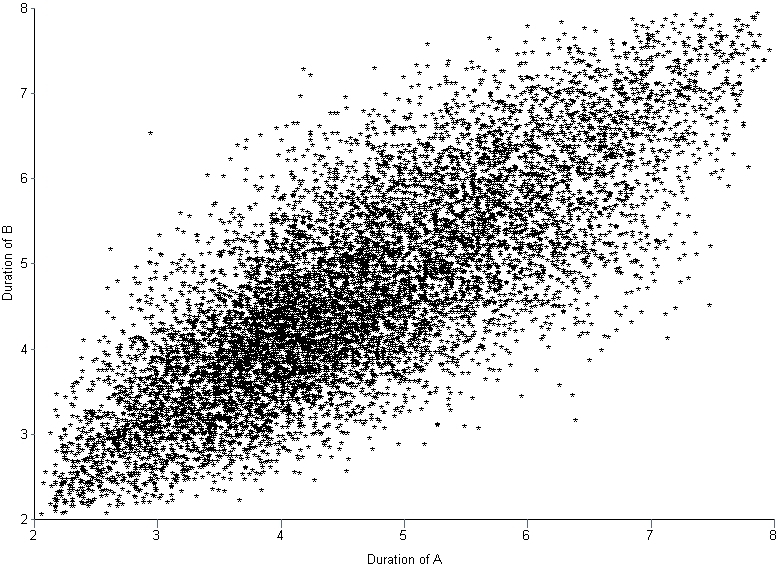 Since the original data is not changed, the distributions for A and B are preserved. Although the idea behind the method is simple, it is technically quite complex. The details of the technique aren’t important – but I offer a partial “hand-waving” explanation in the appendix at the end of this post. Fortunately I didn’t have to implement the Iman-Conover algorithm because someone else has done the hard work: Steve Roxburgh has written a graphical tool to generate sets of correlated random variables using the technique (follow this link to download the software and this one to view a brief tutorial) . I used Roxburgh’s utility to generate sets of random variables for my simulations. I looked at two cases: the first with no correlation between A and B and the second with a correlation of 0.79 between A and B. Each simulation consisted of 10,000 trials – basically I generated two sets of 10,000 triangularly-distributed random numbers, the first with a correlation coefficient close to zero and the second with a correlation coefficient of 0.79. Figures 2 and 3 depict scatter plots of the durations of A vs. the durations of B (for the same trial) for the uncorrelated and correlated cases. The correlation is pretty clear to see in Figure 3. 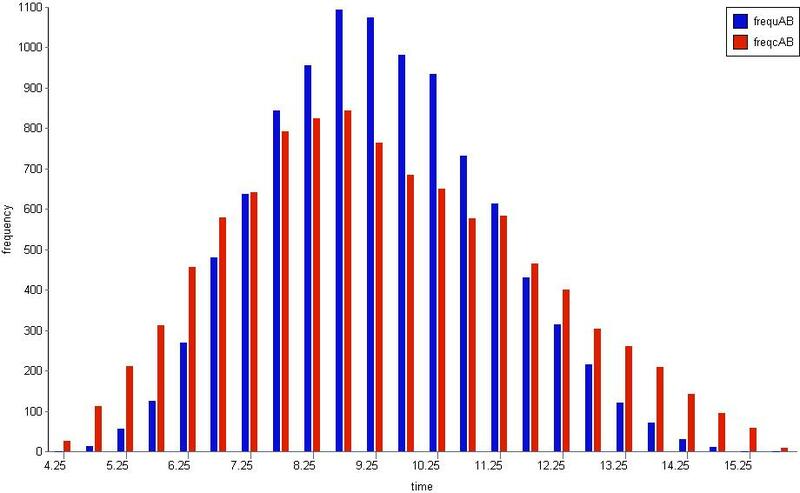 To check that the generated trials for A and B do indeed satisfy the triangular distribution, I divided the difference between the minimum and maximum times (for the individual tasks) into 0.5 day intervals and plotted the number of trials that fall into each interval. The resulting histograms are shown in Figure 4. Note that the blue and red bars are frequency plots for the case where A and B are uncorrelated and the green and pink (purple?) bars are for the case where they are correlated. The histograms for all four cases are very similar, demonstrating that they all follow the specified triangular distribution. Figures 2 through 4 give confidence (but do not prove!) that Roxburgh’s utility works as advertised: i.e. that it generates sets of correlated random numbers in a way that preserves the desired distribution. Now, to simulate A and B in sequence I simply added the durations of the individual tasks for each trial. I did this twice – once each for the correlated and uncorrelated data sets – which yielded two sets of completion times, varying between 4 days (the theoretical minimum) and 16 days (the theoretical maximum). As before, I plotted a frequency histogram for the uncorrelated and correlated case (see Figure 5). Note that the difference in the heights of the bars has no significance – it is an artefact of having the same number of trials (10,000) in both cases. What is significant is the difference in the spread of the two plots – the correlated case has a greater spread signifying an increased probability of very low and very high completion times compared to the uncorrelated case. Note that the uncorrelated case resembles a Normal distribution – it is more symmetric than the original triangular distribution. This is a consequence of the Central Limit Theorem which states that the sum of identically distributed, independent (i.e. uncorrelated) random numbers is Normally distributed, regardless of the form of original distribution. The correlated distribution, on the other hand, has retained the shape of the original triangular distribution. This is no surprise: the relatively high correlation coefficient ensures that A and B will behave in a similar fashion and, hence, so will their sum. Figure 6 is a plot of the cumulative distribution function (CDF) for the uncorrelated and correlated cases. The value of the CDFat any time gives the probability that the overall task will finish within time . In both (2) and (3) denotes a sum over all trials. The averages, , for the uncorrelated and correlated cases are virtually identical: 9.32 days and 9.34 days respectively. On the other hand, the standard deviations for the two cases are 1.77 and 2.34 respectively –demonstrating the wider spread in possible completion times for the correlated case. And, of course, a wider spread means greater uncertainty. So, the simulations tell us that correlations increase uncertainty. Let’s try to understand why this happens. Basically, if tasks are correlated positively, they “track” each other: that is, if one takes a long time so will the other (with the same holding for short durations). The upshot of this is that the overall completion time tends to get “stretched” if the first task takes longer than average whereas it gets “compressed” if the first task finishes earlier than average. Since the net effect of stretching and compressing would balance out, we would expect the mean completion time (or any other measure of central tendency – such as the mode or median) to be relatively unaffected. However, because extremes are amplified, we would expect the spread of the distribution to increase. In this post I have highlighted the effect of task correlations on project schedules by comparing the results of simulations for two sequential tasks with and without correlations. The example shows that correlations can increase uncertainty. The mechanism is easy to understand: correlations tend to amplify extreme outcomes, thus increasing the spread in the resulting distribution. The effect of the correlation (compared to the uncorrelated case) can be quantified by comparing the standard deviations of the two cases. Of course, quantifying correlations using a single number is simplistic – real life correlations have all kinds of complex dependencies. Nevertheless, it is a useful first step because it helps one develop an intuition for what might happen in more complicated cases: in hindsight it is easy to see that (positive) correlations will amplify extremes, but the simple model helped me really see it. Below I offer a hand-waving, half- explanation of how the technique works; those interested in a proper, technical explanation should see this paper by Simon Midenhall. where is the rank difference between the duration of A and B on the th instance of the project. Note that rank is calculated relative to all the other instances of a particular task (A or B). This is best explained through the table below, which shows the ranks for all instances of task A and B from my earlier example (columns 3 and 4). Note that ties cause the subsequent number to be skipped. The last column lists the rank differences, . The above can be used to calculate , which works out to 0.776 – which is quite close to the Pearson coefficient calculated earlier (0.787). In practical terms, the Spearman coefficient is often considered to be an approximation to the Pearson coefficient. With that background about the rank correlation, we can now move on to a brief discussion of the Iman-Conover algorithm. The idea is beautifully simple, but a problem remains. How does one calculate the required reference distribution? Unfortunately, this is a fairly technical affair for which I could not find a simple explanation – those interested in a proper, technical discussion of the technique should see Chapter 4 of Midenhall’s paper or the original paper by Iman and Conover. For completeness I should note that some folks have criticised the use of the Iman-Conover algorithm on the grounds that it generates rank correlated random variables instead of Pearson correlated ones. This is a minor technicality which does not impact the main conclusion of this post: i.e. that correlations increase uncertainty. Conventional wisdom deems that any organizational activity involving several people has to be closely supervised to prevent it from dissolving into chaos and anarchy. The assumption underlying this view is that individuals involved in the activity will, if left unsupervised, make decisions based on self interest rather than the common good, and hence will invariably make the wrong decision as far as the collective enterprise is concerned. This assumption finds justification in rational choice theory, which predicts that individuals will act in ways that maximize their personal benefit without any regard to the common good. This view is exemplified in the so-called Tragedy of the Commons, where individuals who have access to a common resource over-exploit it in their pursuit of personal gain, and thus end up depleting the resource completely. Fortunately, this view is demonstrably incorrect: the work of Elinor Ostrom, one of the 2009 Nobel prize winners for Economics, shows that, given the right conditions, groups can work towards the common good even if it means forgoing personal gains. This post is a brief look into Ostrom’s work and the insights it offers into the theory and practice of project management. Classical economics assumes that individuals’ actions are driven by rational self-interest – i.e. the well-known “what’s in it for me” factor (this is one of the assumptions of rational choice theory). So, in a situation where an individual has access to a resource that is also available to others, classical economics predicts that the individual will aim to maximize his or her benefit without any regard to the common good. Clearly, the group will achieve much better results as a whole if it were to exploit the resource in a cooperative way. There are several real-world examples where such cooperative behaviour has been successful in achieving outcomes for the common good (see this paper for some). However, according to classical economic theory, such cooperative behaviour is simply not possible. So, what’s wrong with rational choice theory? Because individuals are boundedly rational, they do not calculate a complete set of strategies for every situation they face. Few situations in life generate information about all potential actions that one can take, all outcomes that can be obtained, and all strategies that others can take. Secondly, rational choice theory assumes that humans behave as self-centered, short-term maximisers. Such theories – which assume that humans act solely out of self interest – work in competitive situations (such as the stock-market) but do not work in situations in which collective action is called for. Ostrom’s work essentially addresses the shortcomings of rational choice theory. …Ostrom’s work is concerned, fundamentally, with challenging Garret Hardin’s famous, Tragedy of the Commons [Note: Hardin’s article can be accessed here], itself a living expression of neoclassical thinking. Ostrom suggests that far from a tragedy, the commons can be managed from the bottom-up for a shared prosperity — given the right institutions…. Rational choice works well in highly competitive situations such as the stock market, where personal gain is the whole aim of the game. However, it does not work in situations that demand collective action – and Ostrom presents some very general evidence to back this claim. Communication: In the rational view, communication makes no difference to the outcome. That is, even if individuals make promises and commitments to each other (through communication), they will invariably break these for the sake of personal gain …or so the theory goes. In real life, however, it has been found that opportunities for communication significantly raise the cooperation rate in collective efforts (see this paper abstract or this one, for example). Moreover, research shows that face-to-face is far superior to any other form of communication, and that the main benefit achieved through communication is exchanging mutual commitment (“I promise to do this if you’ll promise to do that”) and increasing trust between individuals. It is interesting that the main role of communication is to enhance the relationship between individuals rather than to transfer information. Innovative Governance: Communication by itself may not be enough; there must be consequences for those who break promises and commitments. Accordingly, cooperation can be encouraged by implementing mutually accepted rules for individual conduct, and imposing sanctions on those who violate them. This effectively amounts to designing and implementing novel governance structures for the activity. Note that this must be done by the group; rules thrust upon the group by an external authority are unlikely to work. Reciprocity: this refers to a family of strategies that are based on the expectation that people will respond to each other in kind – i.e. that they will do unto others as others do unto them. In group situations, reciprocity can be a very effective means to promote and sustain cooperative behaviour. Reputation: This refers to the general view of others towards a person. As such, reputation is a part of how others perceive a person, so it forms a part of the identity of the person in question. In situations demanding collective action, people might make judgements on a person’s reliability and trustworthiness based on his or her reputation. Trust: Trust refers to expectations regarding others’ responses in situations where one has to act before others. Clearly, trust is an important factor in situations where others have to rely on others to do the right thing. According to Ostrom, face-to-face communication and innovative governance can change the structure of dysfunctional collective situations by providing those involved with opportunities to enhance these core relationships. On the flip side, heavy-handed interventions and increased competition between individuals will to reduce them. Projects are temporary organisations set up in order to achieve specified objectives. Achieving these objectives typically requires collective and coordinated action. Although project team members work within more or less structured (and often rigid) environments, how individuals work and interact with others on the team is still largely a matter of personal choice. It is thus reasonable to expect that some aspects of theories of choice will be relevant to project situations. The importance of communication in projects cannot be overstated. Many project failures can be attributed to a breakdown of communication, particularly at project interfaces (see my post on obstacles to project communication for more on this), Ostrom’s work reiterates the importance of communication, specifically emphasizing the need for face-to-face interactions. From experience I can vouch for the efficacy of face-to-face communication in defusing crises and clearing up misunderstandings. 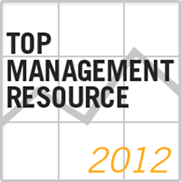 In most project environments, governance is imposed by management. Most organisations have follow methodologies which have excruciatingly detailed prescriptions on how projects should be controlled and managed. Ostrom’s work suggests that a “light hand on the tiller” may work better. Such a view is supported by research in organisational theory (see my post on project management in post-bureaucratic organisations for example). If a particular project control doesn’t work well or is too intrusive, change it. Better yet, seek the team’s input on what changes should be made. In fact, most methodologies give practitioners the latitude to customize processes to suit their environments. Unfortunately many organisations fail to take advantage of this flexibility, and consequently many project managers come to believe that control-oriented governance is the be all and end all of their job descriptions. Is it any wonder that project teams often complain about unnecessary bureaucracy getting in the way of work? Finally, it isn’t hard to argue that the core relationships of reciprocity, reputation and trust would serve project teams just as well as they do other collectives. Teams in which individuals help each other (reciprocity), are aware of each others’ strengths (reputation) and know that they can rely on others if they need to (trust), not only have a better chance of success, but also make for a less stressful work environment. Unfortunately these relationships have long been dismissed by project rationalists as “warm and fuzzy” fluff, but perhaps the recognition of these in mainstream economic thought will change that. Classical theories of choice are based on the assumption that those making choices are rational and that they make decisions based on narrow self interest. These theories, which assume the best (rationality) and worst (self-interest) in humans, invariably yield pessimistic predictions when applied to situations that demand collective action. This is often used to justify external interventions aimed at imposing rules and enforcing cooperation, thus perpetuating a pessimistic view of the rational but selfish individual. Ostrom’s work – which uses a mix of fieldwork, experiment, model building and theorizing – highlights the flaws in theory of rational choice, and shows how cooperative action is indeed possible, providing certain important relationships are fostered through internal communication and governance. Externally imposed edicts, rules and structures are largely unnecessary, and may even be counterproductive. Projects are essentially cooperative endeavours. Given this, it is reasonable to expect that many of Ostrom’s insights into the conditions required for individuals to cooperate should apply to project environments. My main aim in this post was to describe some elements of Ostrom’s prize-winning work and how they apply to project management. I hope that the points I’ve made are plausible, if not wholly convincing. And even if they aren’t, I hope this post has got you thinking about ways to increase cooperation within your project team.